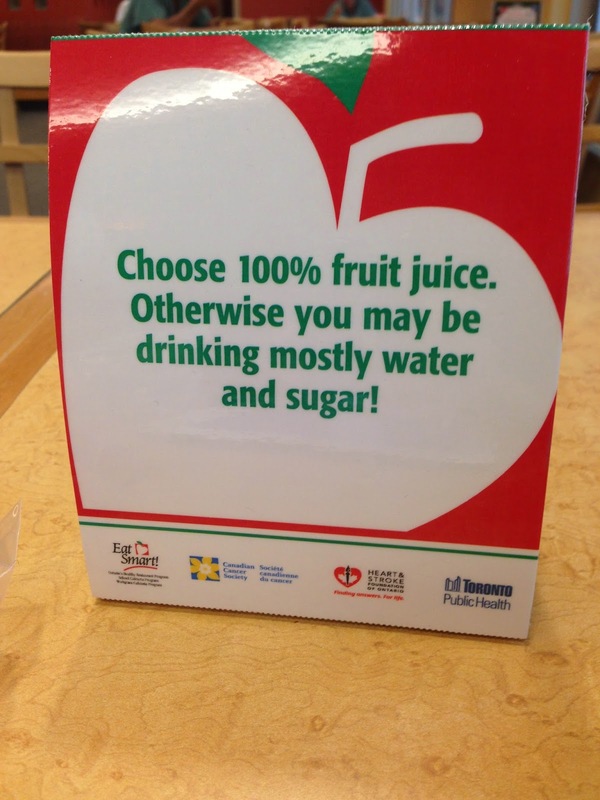 Thanks to a fellow Canadian MD for sharing this staggeringly horrible piece of public health advice that she found on a cafeteria table Toronto's St. Michael's hospital. "Choose 100% fruit juice. Otherwise you may be drinking mostly sugar and water!" Perhaps someone from the Ontario Public Health Association, The Canadian Cancer Society, The Heart and Stroke Foundation, or Toronto Public Health would like to weigh in and explain what exactly people who drink 100% fruit juice will be consuming beyond mostly sugar and water? Honestly, I'd really love to know as I would have thought that contributing to the health halo of juice would not be in public health's best interest. (Updates: An earlier version of this post had wrongly identified Eat Smart! as a Dietitians of Canada initiative rather than an OPHA initiative.